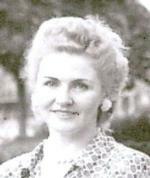 MOZSI ETELKA MOZSI (nee Kucsera), age 91. Beloved wife of the late Istvan; dear mother of Maria Hokky, George Mozsy and Joseph (Tina) Mozsi. Grandmother of four, great-grandmother of eight. Memorial Mass SATURDAY, APRIL 24, 11 A.M. AT ST. COLMAN CHURCH, 2027 W. 65 ST., where family will receive friends from 10:30 A.M.